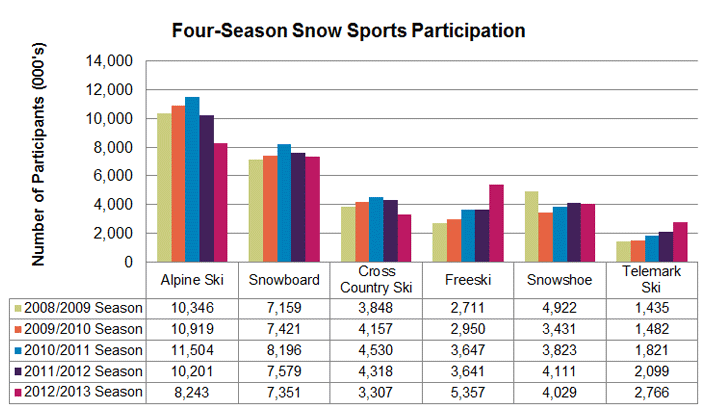 Snowsports Industries America have released their annual Snow Sports Participant Study showing that overall snowsports participation is down 3% year on year. Noting the slow start to the season, the survey suggested that there were 19.3 million participants across all disciplines. There was a drop in Alpine Skiing participation by 19%, which with 8.2 million participants is still the most popular activity. Snowboarding is fell to 7.3 million people, while Freeskiing (5.3m) and Telemark Skiing (2.7m) both saw small increases. The figures contrasted with the recent Crystal Ski Industry Report, which pointed to a 1% increase in the British market. At just 900,000 participants the UK market is only a tenth of the size of the US market. It should be noted that the SIA survey is drawn from a sample of interviews with American households, whereas the Crystal survey is based on their own internal research. For an entertaining look at the statistical weaknesses of the SIA report, we highly recommend this blog post from Illicit Snowboarding.